Like I don’t have enough ham radio interests to keep me busy, but sometimes I have the attention span of a hummingbird and want to try new things that catch my eye. 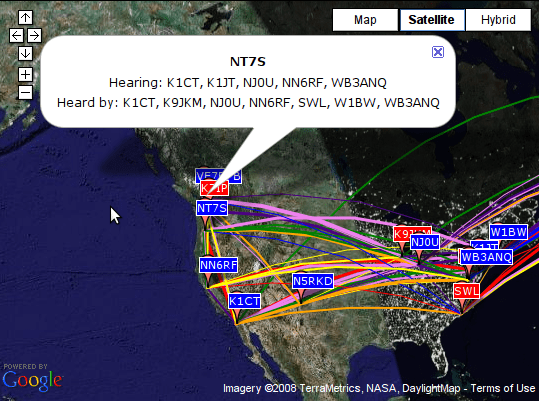 Such was the case when I saw VK2TPM’s blog post about getting WSPR up and running on his Ubuntu Intrepid box (thanks for the tip of the hat on the other post, Peter!). I’ve heard quite a bit of rumbling about this MEPT stuff on the ham blogsphere, so seeing Peter’s instructions finally pushed me over the egde to try it. 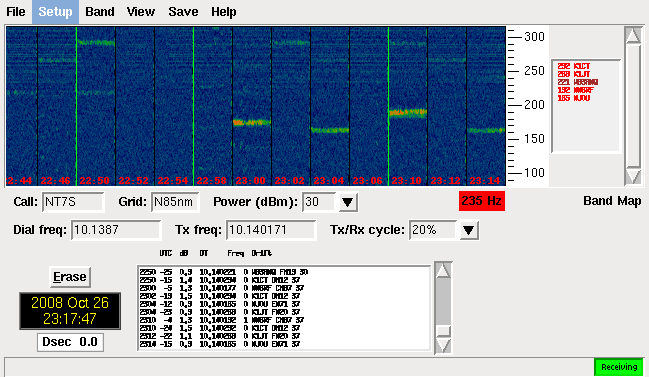 After a few false starts due to unresolved dependancies (I guess you could call it the Linux version of DLL Hell), I was off and running with the WSPR Python GUI. It seemed to work FB once I got it to execute, but I was having a real hard time reading the font in the widgets that showed the stations spotted. No big deal, since I could open the ALL_MEPT.TXT logfile to read them. I also can’t seem to get the spots to automatically upload to the spotting web page, but I am able to send the ALL_MEPT.TXT file manually. Since the audio and PTT interfaces to the IC-718 were already in place, it was simple to start transmitting my own beacon packets as well. I set my power for approximately +30 dBm (1 watt) and let the program do its thing while I did other chores around the house. I came back a while later, and lo-and-behold, people were hearing me! I never crossed the pond, but did get across the continent (as you can see to the right). Not bad for a first try, but I’m hoping to haul my signal across the ocean for some DX. I’ll keep running the beacon for the next few hours to wait for the terminator to cross over me. I’m guessing I’ll have a better chance of getting my 1 watt heard in distant lands when I have the gray line working for me. Fun stuff, and easy to do if you already are set up for working digimodes. I still can’t get anyone to hear me, can’t figure out what I’m doing wrong.